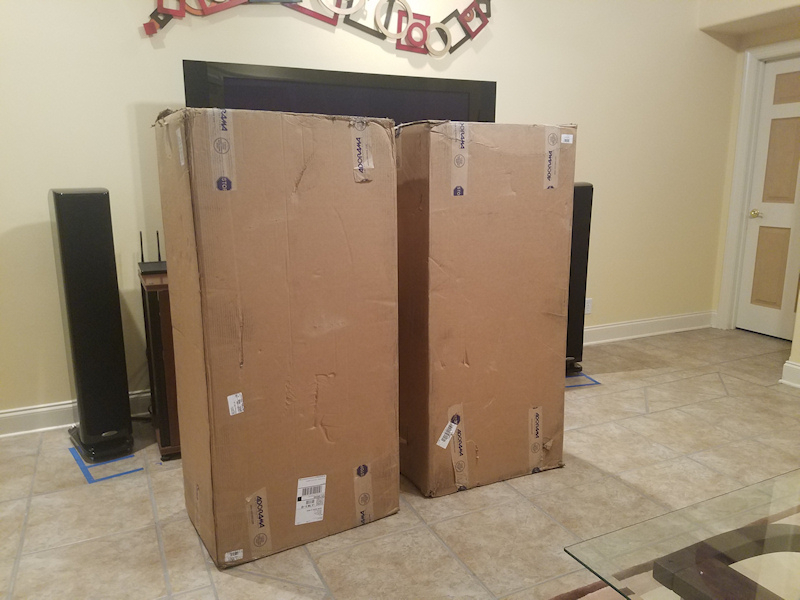 A pair of LSiM 705s were in my home theater system from April of 2017 to July of 2018. While I was very pleased with the 705's performance for both music and movies, I never could shake the desire the compare them against the 707s. The conventional wisdom is that the 705s occupy the "sweet spot in the LSiM series, and that the 707s can sound boomy and unbalanced in some rooms. It is reasonable that the 705's smaller size would make it a much better fit for a wider range of room sizes. 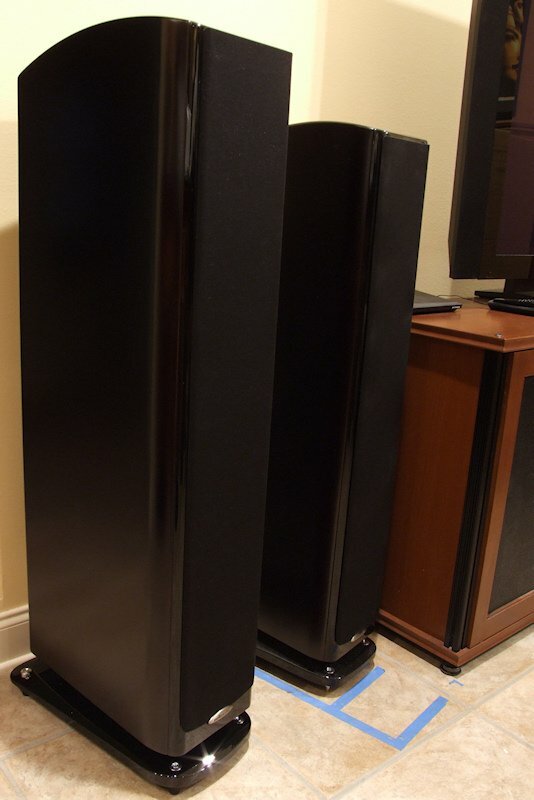 In my room, which measures 15' wide x 18.5' long x 12' high, the LSiM 707s had more detail, clarity, speed, dynamics, and bass refinement than the 705s. Figure 1. Side-by-side, LSiM 707 and the smaller LSiM 705. The LSiM 707s were set up along the same toe in guides taped to the floor for the 705s. The inner edges of the 707s are 7'-8" apart and each speaker's outer rear corner is 8.5" from the rear wall. Neither speaker is close to a corner. The listener's ears are 12' from the front plane of the speakers. A center line through each speaker forms an isosceles triangle with a base length of 8.5' and sides of 14.5'. The center lines of the speakers cross at a point 1'-10' behind the listener's ears. The center line of each speaker forms an angle of 75 degrees with the triangle base. A bubble level was used to level the speakers laterally and front to back. The ceiling is 12' and there are no room treatments. There was some brightness and hissy sibilance on some songs, but that went away after six hours of continuous play. I was impressed with the sound staging and bass performance immediately. Prior to critical listening, the LSiM 707s were run in with music and movies for six days straight (144 hours). I heard improvements in midrange detail, image weight, bass detail, bass speed, bass weight and bass articulation up to the third day (72 hours of continuous playback). I did not perceive further changes after the third day. 1. Wider and deeper sound stage. Imaging of the 705s did not extend beyond the outer edges of the speakers. The sound stage of the 707s extends 3 feet beyond the speaker outer edges. Projection from the 707's front plane was 2-4 feet depending on recording...same as the 705s. the 707's depth was 1-2 feet further back than the 705's. 2. More image weight at sides of the sound stage. 3. More clarity, detail, and bass weight and definition. Enhanced rumble and growl around bass notes. 4. More cohesive integration with the center channel speaker, which uses the same tweeter, midrange driver, and midwoofer drivers. 5. A more immersive experience with multichannel music. Figure 2. Out with the old. I was prepared for long back and forth sessions between the 705 and 707, but the 707s quickly displaced the 705s. Figure 3. In with the new. The LSiM 707s brought a significant level of refinement to the sound of two channel music, multichannel music, and 5.1 movie soundtracks. 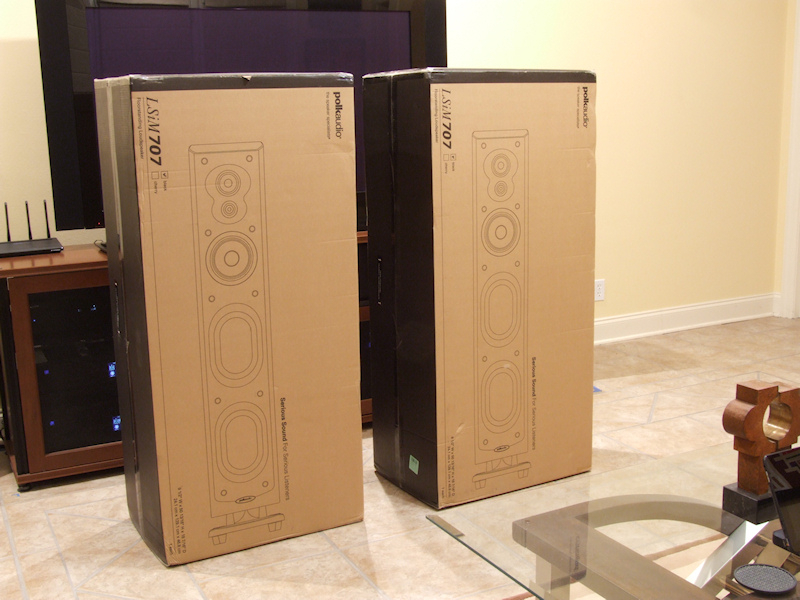 Unlike the case with my LSiM 705s, this time the dealer shipped each speaker in an outer box. 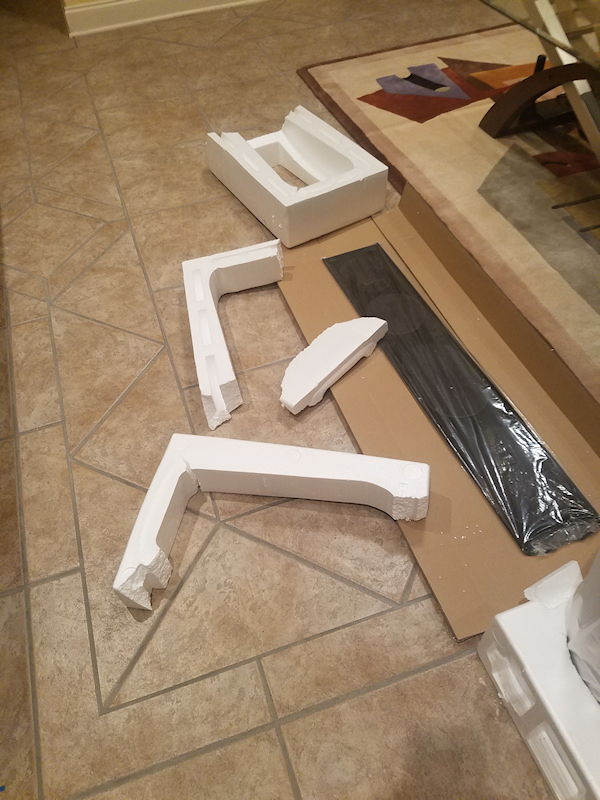 The Styrofoam blocks of one speaker were cracked and busted, but the broken pieces still protected the speaker because they were held tightly in place by the shipping carton and by being taped to the sides of the plastic bag surrounding the speakers. Inside the box, the speakers were wrapped in a cloth sock and then a plastic bag. Figure 4. LSiM 707 shipping boxes. Figure 5. LSiM 707 manufacturer's cartons. Figure 6. Busted Styrofoam of one speaker. My technical curiosity typically leads me to attempt to gain some quantitative understanding why I hear what I hear from a particular audio product. Frequency response, harmonic distortion, and bass decay measurements were taken with the Dayton Audio OmniMic system version 1 ($298). The improved version 2 OmniMic system is the same price. Figure 7. Dayton Audio OmniMic setup. The calibrated microphone was setup at ear height at the center listening position on one of my camera tripods. 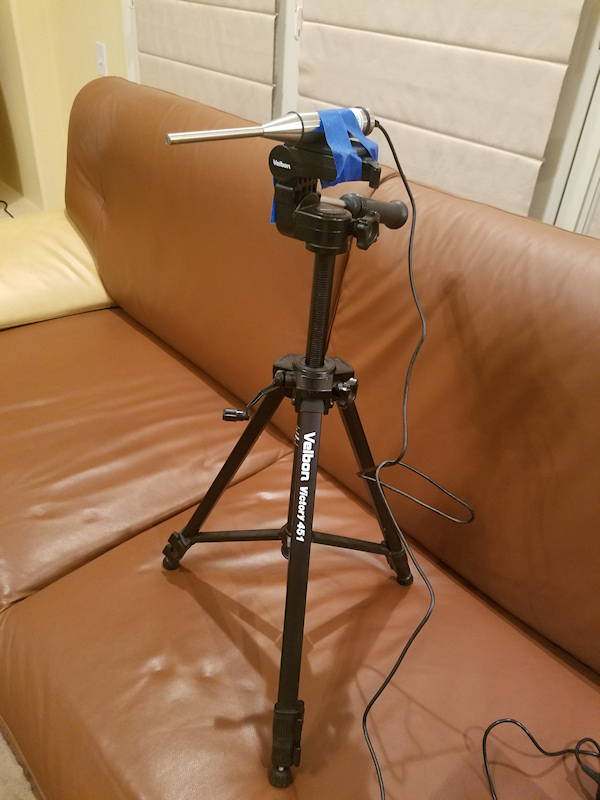 The current version 2 OmniMic system includes a microphone stand. Figure 8. 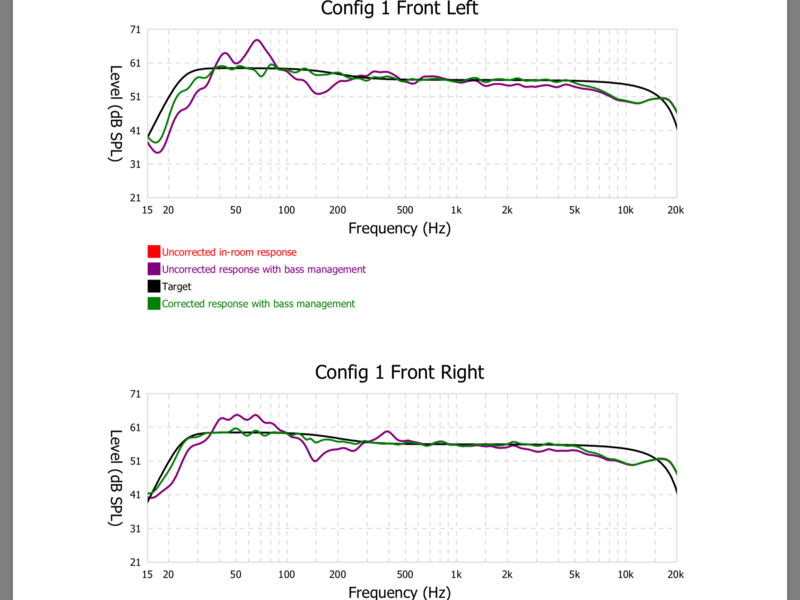 LSiM 707 frequency response at center listening position. The frequency response in this untreated room was very good and was perceived by my ears to be very balanced and flat across the frequency spectrum. Although there are peaks and dips in the response, there are also peaks and dips in human hearing response. I could achieve smoother frequency response with the judicious placement of room treatments...but they wouldn't be very aesthetically pleasing. For now, I will hold off on the room treatments until a future time when I am more dedicated to home theater than I am now...and when I have a dedicated theater room. Figure 9. 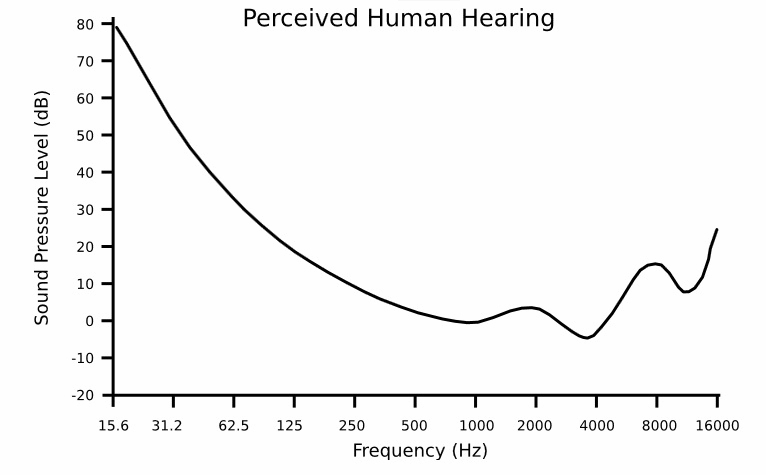 Equal Loudness Contour at the human threshold of hearing. Figure 10. The LSiM 707 harmonic distortion plot shows the relative levels of 2nd, 3rd, 4th, and 5th harmonic to frequency. Dark blue - sum of 2nd-5th harmonics. Light blue - 5th harmonic. Harmonic distortion was low and was dominated by second order products, which add a measure of "fullness" to the sound since they are the same frequencies as the fundamentals, just one octave higher. Figure 11. LSiM 707's bass decay characteristics were relatively flat and well behaved, contributing to clear, articulate, and tactile bass response. Bass decay plots show how long it takes the sound to decay at each frequency. The ideal situation is flat response which means that some bass notes do not last much longer than others. Significant differences in decay times and very long decay times can cause a decrease in bass definition. Lower and flatter is better. For reference, compare the not-as-nice bass decay plot of the SDA CRS+ speakers in my office at work (figure 12). Figure 12. Bass decay plot of SDA CRS+ speakers in office at work. With the 707s, I revisited using better jumpers between the low and high frequency binding posts. With the 705s, I heard a small improvement when going from the stock jumpers to jumpers made of AudioQuest GO-4 speaker cable and terminated with AudioQuest gold plated BFA bananas. 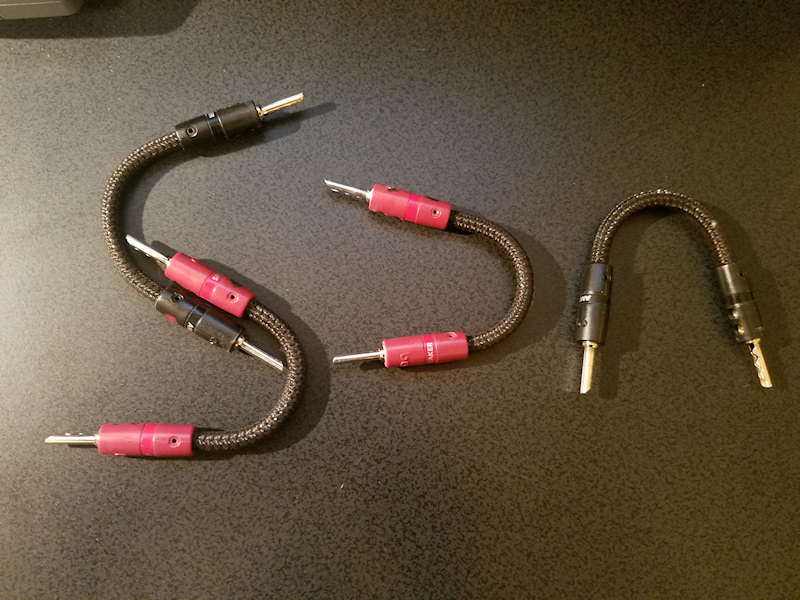 With the 705s, I did not hear a difference when I went from the GO-4 jumpers to the AudioQuest Perfect Surface Copper jumpers. With the 707s, I heard more clarity and detail with the Perfect Surface Copper jumpers. It was if the volume had been turned up a little bit. Figure 13. AudioQuest Perfect Surface Copper jumpers. Figure 14. That's better: AudioQuest jumpers installed. Figure 15. Such Good Sound! 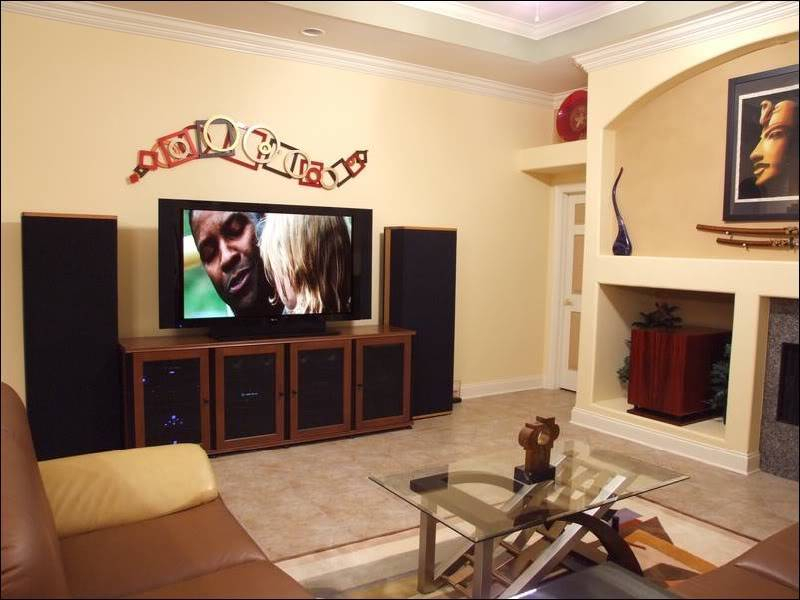 It's interesting to note that this home theater upgrade project began as an exercise in downsizing. 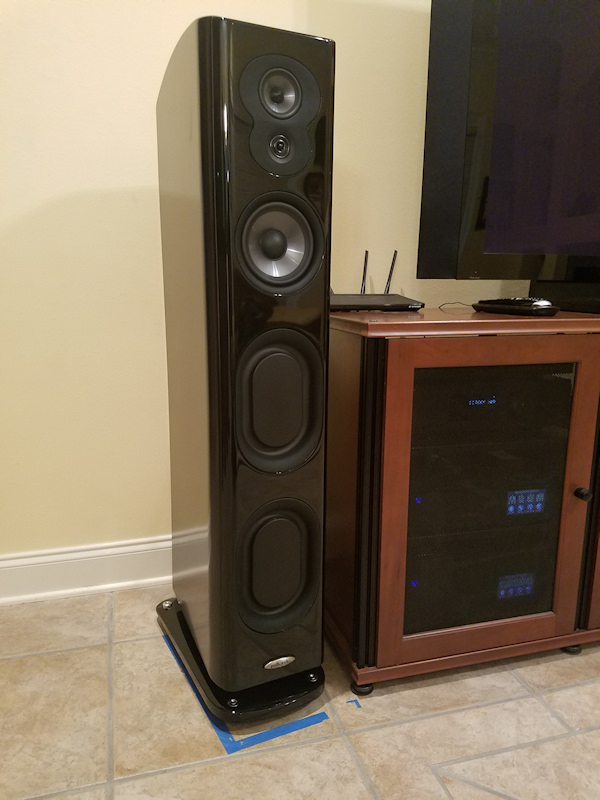 I did downsize the front speakers from SDA SRSs to LSiM707s and the surround speakers were downsized from LSi15 towers to LSiM 702 F/X wall mounts. However, there were substantial upgrades in amplifiers, the preamp/processor, interconnects, and in source components. 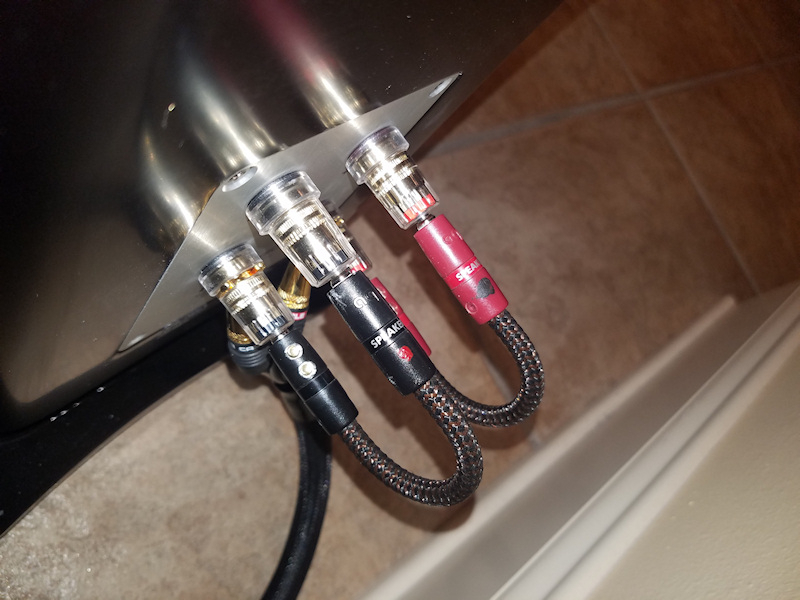 The only thing left to do now is replace the Monster speaker cables (used with the front and center channel speakers) with Douglass Connection DCF92 cables. Monster Z3 Reference Speaker Cable 10 Feet/Side Cen. Spk. Monster Z3 Reference Speaker Cable 15 Feet/Side Fr. Spk. I am curious to know if you would trial again in a room better suited for the 705s. I assume the 705s would perform better in a smaller overall space. As the 705s are boxed and stored, it will probably be a while before I listen to them again. Thanks for the professional review. Since I have a few SL2500s on hand, I'll try that mod and see how it works. However that experiment will have to wait until a future time...when I am more dedicated to audio than I am now. I hope I didn't give the impression that I didn't like the 705s. I did and I still do. It's just that they were outgunned by the 707s...which currently sit in Polk's "flagship" position. Also - did you ever do a review of the 702's? Of course you should have...you could have sent them back if they didn't work out. I bought mine strictly out of curiosity. I knew if I purchased the 705’s I would always wonder about the 707’s, that’s why I went with the 707’s despite the praise of the 705’s being a better over all speaker. Thanks for the review DK, it is nice to see one where the 707’s came out on top.. But if I had bought the 707s, I would have always wondered if the 705s would be better since they are reputed to be the better overall speaker. That's why my original plan was to evaluate them both. However, I was so happy with the 705s that I put off the 707 comparison for a long time. In addition to these comments regarding the bass: "More clarity, detail, and bass weight and definition. Enhanced rumble and growl around bass notes." - do you feel that the bass response now extends lower and reproduces deeper frequencies than the 705s? The 707 goes a little lower in the bass range than the 705, but that's not all there is to it. Since the 707 is essentially a larger version of the 705, the 707 can reproduce the same bass frequencies with less effort and with more of the overtone structure intact. Awesome and really comprehensive review . I've only had a chance to listening to the LSiM705s which I thought were excellent. Very curious to try the big brothers now. Always good to hear from some one who actually has both sets of speakers share their experience. Only bad thing is that now you have my interest piqued!! LOL, one can only do that for so long. As it turns out, I've been off this board for some time, and now, I'm looking to see which direction to head for with my 703's and 706. After some minor research, and now this thread, I believe my direction is clear cut. Thank you Mr. Knight, for your precision and insight!! Wonderful review. Thanks for documenting what I 'thought' I heard. Personally, I don't think the 707s are boomy at all. At least, not to me or in my environment. They could be used for HT alone if one wished. Maybe I'm too tainted by Cerwin-Vegas during my teens. I was satisfied, but, now you have me thinking I need to rework the jumpers. As always, a great, highly informative review. When we attended the last Polk Fest in Baltimore, I remember listening to the 707s, which really impressed me then. Now, I'm really curious about how you would compare their sound to the SDA SRS 1.2tls -- heavily modded, as I recall -- that it seems they replaced. The home theater system had heavily modified SDA SRSs. The two channel system has heavily modified SDA SRS 1.2TLs. Regarding the comparison of sound between the SRSs and the 707s, the thing that first comes to mind is a visual analogy. With regard to front stage size, the 707s are like watching a movie on a nice 60 inch high definition display. The SRSs are like watching the same movie on a nice 100 inch high definition projection screen. I've noticed that taller speakers have more of a "pull up" effect on a center channel located below a television. With the very tall SRSs, dialog appeared to come from the vertical center of the TV screen, even though the center channel speaker was well below the screen. With the LSiM 705s, dialog shifted to the bottom of the TV screen. With the taller LSiM 707s, the dialog shifted back closer to the screen's vertical center. The SRSs were a good timbre match for the LSiM 706c center. The 707s are an exact match. I gave up front stage size by going to the 707s, but I gained a seamless a cohesive front stage, and tight integration among the center, front, and surround speakers. With regard to image weight, clarity, detail, and bass performance, the 707s are closer to the modified SRSs, to the point where I don't miss the SRSs. With the 705s, I never quite "got over" the SRSs, and I would often be reminded of how something sounded with the SRSs by noting a glaring difference in the 705s sound stage size or image weight. Home theater with SDA SRS front speakers. Home theater with LSiM 707 front speakers. You are correct. Those threads are referenced below. So whats going on with the 705's? Last I heard they were in their boxes enjoying their early retirement. Thank you for both clearing up my confusion and characterizing differences and similarities between the SRSs and 707s. It sounds like the 1.2tls would not remedy the deficiencies of the SRSs in the home theater system, although they might be stronger in areas where the SRSs bested the 707s. 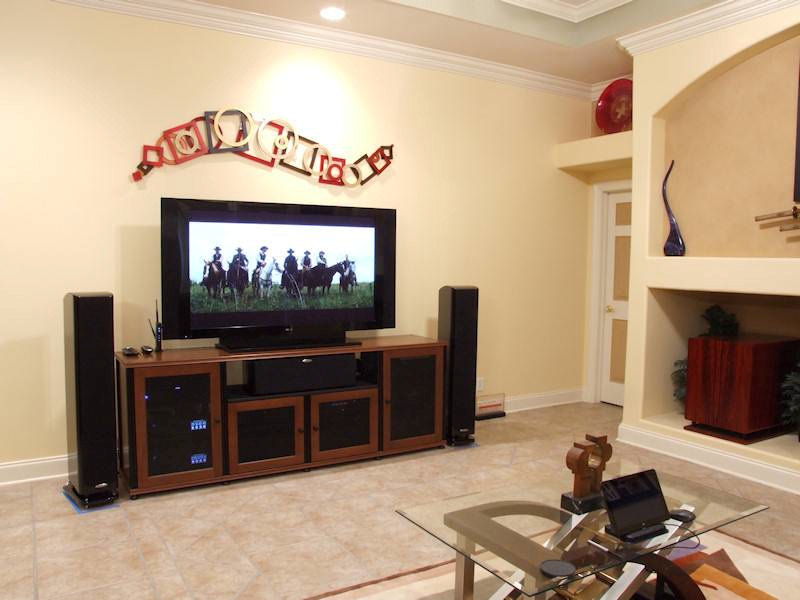 If I had a dedicated theater room, I would go back to SRS fronts, dual CRS+ centers, and CRS+ surround speakers. Great read, thanks for sharing. The one and only time I've demoed the 707's was at the 2016 AXPONA show. 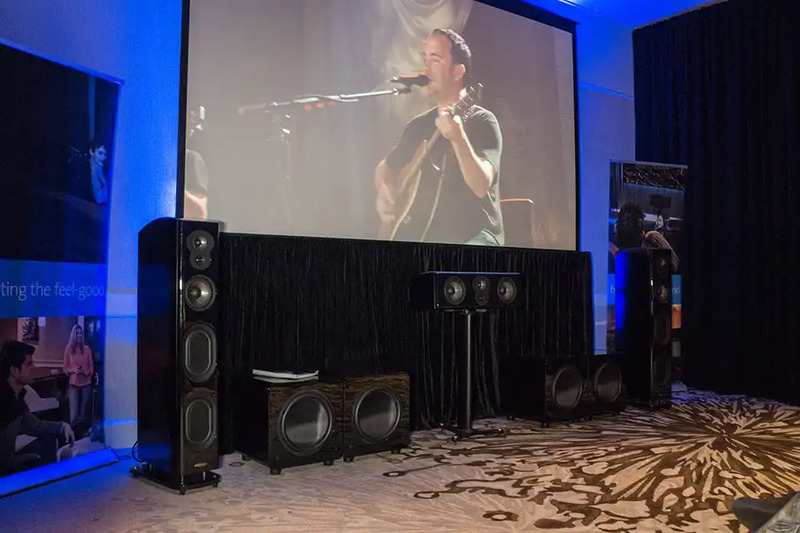 Emotiva had a large theater demo using all LSiM speakers, and SVS subs. I thought they performed well in that application. Very detailed. Thanks for sharing. Thanks for the review. I feel the same way. Mine came directly from Polk on a pallet so no styrofoam damage. They where minty mint!